Recently, I had the privilege of visiting the ESL ministry of New City East Lake in Chattanooga, Tennessee. 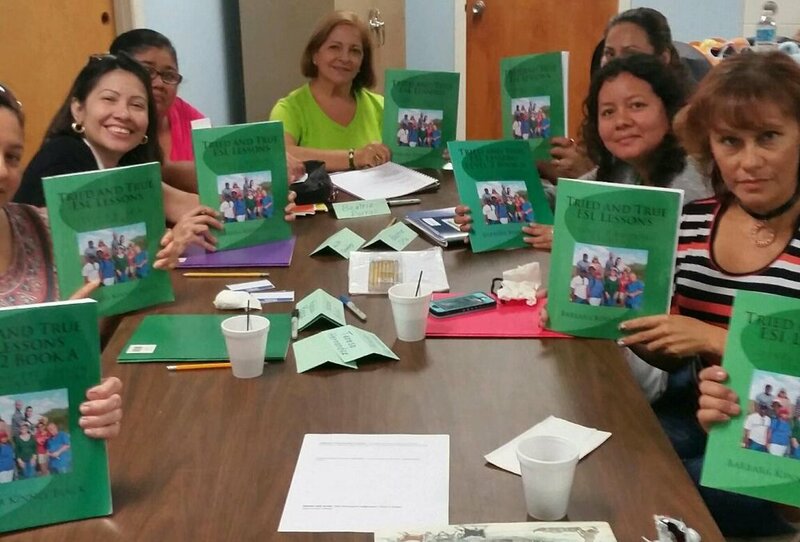 This wonderful ministry has just started using Tried and True ESL Lessons Advanced Vocabulary for their advanced class. We did an introduction to the Tried and True ESL Lessons curriculum for their teachers who will implement the curriculum later this year. The staff was delightful and warm and the students were responsive to the teachers’ obvious love for them. To me, it’s always amazing how God brings together a diversity of individuals with a variety of gifts and experiences to work as a team reaching out to internationals. New City East Lake is a prime example of this fact. Their director, Eunice, is from Alcapulco, Mexico. She works tirelessly behind the scenes to make sure the teachers and staff have all they need for success. She is also a fabulous cook and prepares many meals for special cultural exchange events with the students. Eunice sees herself as a bridge for the students as she interprets the North American culture for them in many confusing situations. One of the teaching assistants is Carolyn, a mature woman nearing her 80's who brings a huge heart to the students and an attitude of service as she willingly fills in wherever she is most needed. She truly understands the importance of being whatever the students need to help them learn. For example, she recently found herself sitting on the floor with maps of Chattanooga surrounding her and eager ESL students “driving” toy cars along the maps following her directions. There’s a young woman named Sarah who is a basketball coach for a college located in Chattanooga. She strives to also step into the students’ world by seeking to learn their first language in order to better communicate with and understand those whom she is helping to master the English language. Two couples work together in the ESL ministry and bring a variety of experiences to the table. First, there’s Jeremiah and Amy. Jeremiah is from the U.S. while Amy is Chinese from Canada. They met while teaching English in China. They bring a sweet spirit and patience to their students, as well as a first-hand knowledge of what it’s like to live in a country not one’s own. 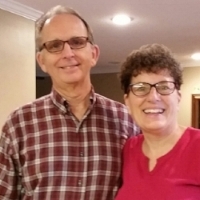 The second couple is Becky and Carl, both from the U.S. They’ve lived almost 20 years in various European countries where they learned to teach ESL by jumping in with both feet and doing it! Becky teaches the most advanced class. Her students obviously love and respect her. They seemed willing to open up enthusiastically in conversation. Students also responded well to her leadership in the class. There are many other faithful teachers and staff at New City East Lake working tirelessly among the students. These are just a few of the ones we had the privilege to get to know during our visit. One student also stood out to us as we had the privilege of engaging in extensive conversation with him. Ricardo is from Guatemala. He’s been in the U.S. some time now and working with a family member. He was very enthusiastic in class volunteering to answer questions and speak. After class he shared with us that his goal is to become an ESL teacher himself. He is working towards that goal by completing his high school education this year. So, if you are near Chattanooga, Tennessee, or know of internationals moving to that area, I can highly recommend the ESL ministry at New City East Lake Church. If your ministry is using Tried and True ESL Lessons or would like to know more about Tried and True ESL Lessons curriculum, contact us on the website and we’ll see about scheduling a visit. A few months back I received a call from Pastor David Leiva from Iglesia Bautista Estrella de Belen Norte. 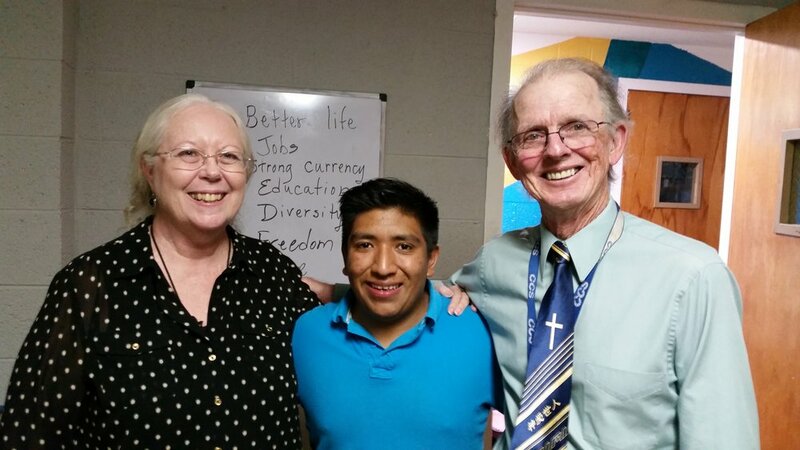 Pastor David asked if I’d come teach his Aunt Gloria how to conduct an ESL ministry. After much conversation, it was agreed that I’d lead an ESL workshop in his church, provided he had 10 participants to attend. Pastor David became very excited about the ESL ministry possibility and he subsequently invited me to present an Awareness Conference for 10 more Spanish language pastors in South Florida. Wow! That’s quite an honor for me. On the day, we demonstrated a typical ESL ministry by having the pastors return to the classroom as ESL students for a first-hand look at what an ESL class is really like. They enthusiastically participated. Judging by the looks on their faces, I believe they enjoyed the games practicing the language the most! The final activity of the demonstration lesson was to work as a team to put the pieces of a scripture verse into correct order. Suddenly, the light switched on for these servants of God as they saw the potential for ministry outreach through the ESL ministry. When we held the ESL Workshop just 4 weeks later, 10 individuals from 4 different churches attended. We’re looking forward to seeing what new ESL ministries open in this community. 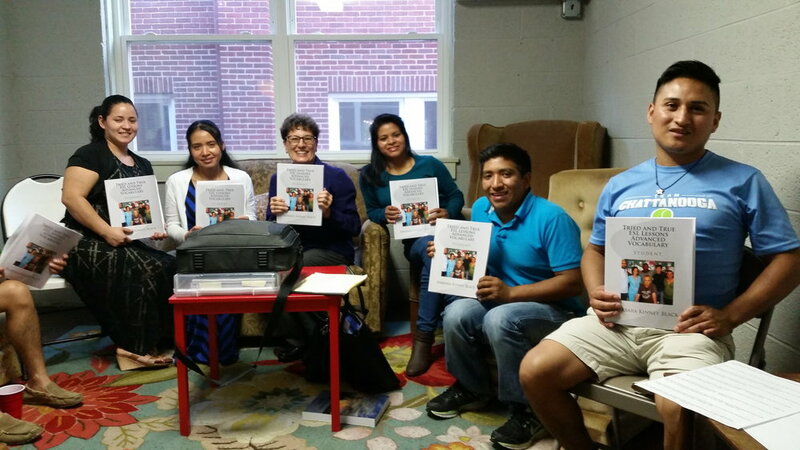 To schedule an ESL training workshop for your church, contact us here. Pastors work together to put the scrambled pieces of a Scripture verse into correct order. FBC Pine Castle was one of the first churches to begin using Tried and True ESL Lessons in the Fall of 2016. They used Level 1 Beginner, and Level 2 High Beginner. A few months later, Pine Castle ministry director, Louise French, made ESL real again. After teaching the lesson titled, Staying Well, to her high beginners from Level 2, Book A, Louise brought in homemade chicken soup in a crock pot. As students arrived to class, she greeted them with a cup of the homemade goodness. It was served along with hot tea and lemon, which is one of the remedies suggested for a cold in the Staying Well lesson. In addition to teaching, Louise also wears the director hat. When she asked her teachers and students how they liked Tried and True ESL Lessons, she got loads of favorable feedback. 1. Reading Glasses. Every time Louise goes to the local dollar store, she picks up a couple of pairs of reading glasses. She has a basket full of glasses available to students who may need a little help to see their books or the board more clearly. 2. Prayer Partners. Students are given an opportunity to have one person pray for them every day during the semester. Louise has solicited prayer partners from her church members who commit to pray for three months for one student. Louise prayerfully matches each ESL student with a willing volunteer from the church. They have a special meeting time at the beginning of the semester where prayers meet the students for whom they will be praying. So, that’s just a few of the practical ways First Baptist Church of Pine Castle, Florida, has been making ESL real for their students since 1985. May they have many more years of fruitful ESL classes. These are the kinds of e-mails I love to receive—churches excited about getting involved in ESL ministry. After 17 years of leading the 11-hour ESL Training Workshop for many churches, I’ve had the privilege of seeing lots of ESL ministries start. At the same time, I’ve also seen some ministries struggle. Upon investigation, the struggle is often because volunteer teachers find it challenging to write viable weekly ESL lesson plans. This is one of the main reasons Tried and True ESL Lessons and Tried and True ESL Lessons Time Saving Lesson Plans for Instructors was created—to eliminate the struggle many experience in writing ESL lesson plans. Four weeks after Wendy’s first e-mail to me, I received an update: “Hello from lovely Florida. Well, it’s done—registration and placement interviews and 125 students! We are starting this week!” Wendy chose Tried and True ESL Lessons for her new ESL ministry and the anticipated 125 students. I look forward to reports of success from this new ministry.